Trailcology: Hewlett Gulch Gets A Little Help From It's Friends! Hewlett Gulch Gets A Little Help From It's Friends! This past Saturday I volunteered with the Wildlands Restoration Volunteers (WRV) to help finish building a new section of trail in Hewletts Gulch. Hewletts was heavily impacted by the High Park Fire that occurred this summer, much of the landscape and trail were scorched by the fire. Prior to the fire, WRV had begun a trail project that would close the current "trail" that created a lollipop loop at the North end of the Hewlett Gulch trail and create an official, well-constructed, trail to take it's place. The High Park Fire put a hold on the trail construction until the United States Forest Service (USFS) deemed the area safe to return. After many hazard trees were felled and the monsoon season came to an end, volunteers were allowed to return to finish the project. I made it a point to join the project manager and crew leader who were going to run out ahead of everyone to flag the remaining section of trail. It was another great opportunity to have a voice in the creation of local trails. We placed the flags along the route according to the topography and in a manner that would create a fun and sustainable trail for mountain bikers - the targeted users for this trail. After the rest of the volunteer crews came and we had our crew talks, we started creating the new trail, using the flags that marked the critical edge as our guide. It's amazing how quickly you can cut a trail into the side of a hill but it's even more amazing to realize that there is much, MUCH more work to be done on the section you just created to make it a finished, sustainable product. 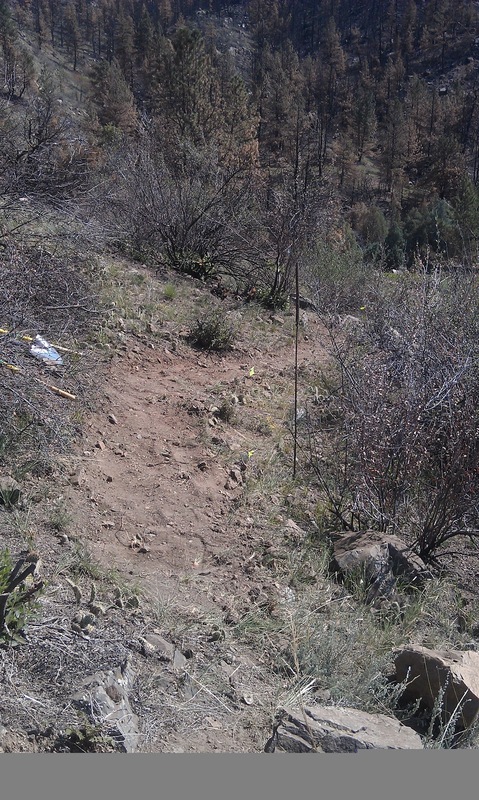 There is a lot of fine-tuning that takes place to make sure you have the proper outslope and backslope for the trail! After our four-man team finished cutting the rough trail, three of us jumped on the opportunity to build a rock wall that would act as a bridge between two adjacent high points along the trail. We spent the better part of the day piecing together, and locating, suitable large rocks to form the base of the wall. Once we had 6 primary rocks in place we started to fill in the gaps with small and medium sized rocks, creating a very solid structure that was easy to walk across. The final step was to fill in the remaining holes with gravel/rubble and loose soil. Eventually, the soil and gravel will work its way down through the cracks and cement-in the large rocks at the base. We had created a wall of rocks that became the base of the trail in a topographical dip that would have promoted run-off and erosion. Now the water will run off the down-slope edge of the trail in a gentle manner, reducing erosion potential. Roughly 40 volunteers came out with WRV on Saturday and we were able to finish about 95% of the remaining trail, which was good enough to allow the USFS to open the Hewlett trail to the public on Monday! This project was a lot of fun and a great way to meet new people who are enthusiastic about trails. Most people were hikers, some were mountain bikers, and some just like to volunteer! Trailcology will strive to bring together all manner of trail users and I hope that we can get to know one-another so that, while we're enjoying the fruits of our labor, we can stop and have a friendly chat with a familiar face, regardless of their choice of trail use.